During my first week as a reformed meat-eater, I relied heavily on salads, quinoa, lentils, and a lot of grilled vegetables for my meals. It wasn't a week of earth shattering, experimental vegetarian recipes, but I did realize that I don't miss meat and I was completely satisfied with my meals. I've received such great feedback since I wrote my first post about my vegetarian diet makeover. Some of you even sent recipes for me to try and offered advice, which I greatly appreciated. I just recently signed up for Peta's Vegetarian/Vegan Starter Kit to spice things up for next week. 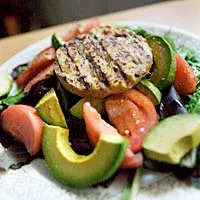 My go-to meal so far involves stacking my plate with mixed salad greens, avocado, tomatoes, and any vegetables I have handy, and topping it off with a store-bought tofu veggie burger. I personally don't love the store-bought burger, but perhaps I haven't found the best brand (it can be a bit on the dry side). But who can beat a meal ready in 5 minutes? Another favorite dish is quinoa. Although this is a trendy grain at the moment because it's so good for you, I grew up eating quinoa. And thanks to its recent surge in popularity, I can now purchase it from almost any big-name grocery store. In fact, even the United Nations declared 2013 to be the "International Year of Quinoa," so naturally I will be eating lots of this diet-friendly whole grain. 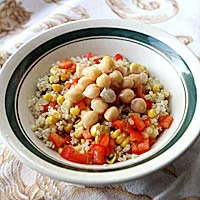 For this quick quinoa salad (pictured), I just added corn, red peppers and chick peas for a satisfying lunch. I always thought I had to cook zucchini until I found this quick marinated recipe. I didn't have mozzarella available so I just topped the salad with grape tomatoes. 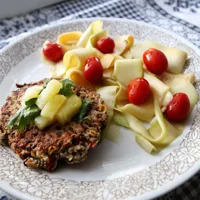 I also made a lentil burger to go with my marinated zucchini salad, which was amazing. However one tip: Next time I would leave out the pineapple salsa--it wasn't a great combo with a marinated salad. Lesson learned!